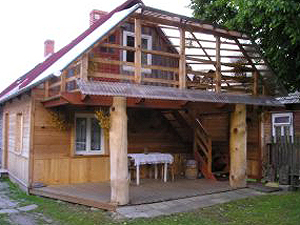 This wooden, independent, one storey house with developed attic is opened all round the year. On the ground floor you can find one triple room (with one double bed, one single bed and fireplace), terrace, kitchen annexe and bathroom. There are two rooms (double room and triple room) with independent outside entrances, shared bathroom, kitchen annexe and roof terrace on the first floor. Triple room is equipped with one double bed and one single bed. Double room includes one twin bed.